A markedly positive account of a growing network of high schools designed to help poor urban youth prepare for college. Freelance journalist and former U.S. Catholic magazine editor Sweas produces a sequel to G.R. Kearney’s More Than a Dream (2008), which told the story of the first school in the network, Cristo Rey Jesuit High School in Chicago. From that beginning in 1996, the Cristo Rey network now includes 28 college-prep schools in cities across the country. Although the schools are Catholic, students need not be, but they must be from low-income families. They are often minorities and are definitely behind in their studies. Besides serving the urban poor and disadvantaged, the system has been a lifesaver for Catholic high schools threatened by a shortage of once-available nun and priest teachers, higher costs and dropping enrollments. The Cristo Rey schools operate corporate work-study programs in which students work for local companies five days per month, an arrangement that brings in money for the school and introduces students to the world of work. Sweas uses the personal stories of students from various schools to illustrate how the system works and how the students view their experiences. To round out her portrait of the network, the author interviewed teachers, administrators, board members and corporate sponsors, nearly all of whom are glowing in their appraisals. 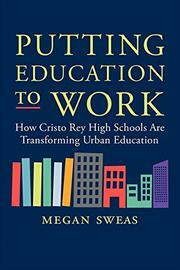 Unfortunately, Sweas’ presentation often reads like a promotion piece for the network—e.g, while frequently mentioning that the schools have a 100 percent college acceptance rate, she omits data on how many students drop out of Cristo Rey high schools, how many actually attend what kind of college and what their college graduation rates are. A rosy but incomplete picture that would be of greater value to educators if the author weren’t trying so hard to sell the system.